The growth of India's media in recent years has raised questions about journalistic standards and prompted a debate about whether the industry should be regulated. Critics say standards have rapidly declined despite the increasing number of media outlets. India has close to 650 television channels, more than 2,000 publications and more than 30 FM radio operators, running 245 stations. The numbers look promising but not everybody is impressed - including Press Council of India (PCI) Chairman Justice Markandey Katju. Mr Katju recently wrote for The Hindu newspaper: "If red lines can be drawn for the legal and medical professions, why should it be any different for profit-making newspapers and TV channels?" The PCI, partly government funded and set up in 1966 with the aim of "preserving the freedom of the press and of maintaining and improving press standards in India", has often been critical of the media under Mr Katju's leadership since October 2011. Mr Katju's comments came after a private member's media regulation bill proposed by MP Meenakshi Natarajan that will be tabled in parliament soon. She argues that journalism standards have been falling lately and this bill would create a powerful body to monitor and regulate content. She is a member of the ruling Congress party, which has distanced itself from the bill, but the move has given a boost to Mr Katju's demand for content regulation. The debate sparked by Mr Katju's comments coincides with a similar issue currently raging in the media regarding the government's proposals to regulate social media. The two debates are feeding off each other and have outraged journalists. While many prominent journalists largely accept that their industry's standards are falling, they furiously refuse the idea of setting up any "outside regulatory body". "I am against external regulation. The media should regulate itself," Outlook magazine's former editor-in-chief Vinod Mehta said in a panel debate on media regulation aired by private news channel CNN-IBN on 1 May. Siddharth Varadarajan, editor of The Hindu, appeared on the same show, where he agreed with Mr Mehta. He pointed out that external regulation may not be very useful in improving journalistic standards. Mr Varadarajan's paper also opposed Mr Katju's remarks in its editorial piece on 1 May. "Such things as sensationalism, exaggeration, mistaken judgements and even false statements made honestly are likely to occur, or at least cannot be totally eliminated, in an environment in which free speech is guaranteed," the paper said. "The answer to this is to defend the right to free expression even as you criticise the specific instances in which it is abused. It is not to shoot the messenger," the paper said. CNN-IBN's National Bureau Chief Bhupendra Chaubey wrote on his Twitter page: "Me to Justice Katju: Guiding of editorial content shouldn't necessarily be regulation". Adding fuel to the debate, a constitutional panel of the Supreme Court recently invited suggestions regarding the framing of guidelines for media coverage of pending court cases. While legal experts clarified that the court is not trying to "gag" the media but is only setting up guidelines, this move by the Supreme Court has sparked fierce opposition from some senior journalists. Veteran journalist Kuldip Nayar said he would lead a movement against any guidelines for court reporting. Mr Katju may have drawn severe criticism for his comments, but he has managed to arouse a debate on journalistic standards. Mr Mehta acknowledged the scope for improvement, saying, "If we keep fudging the issue, then we are opening a window of opportunity for outside intervention." MP Shashi Tharoor of the Congress party, speaking on the same show as Mr Mehta, said "the media has astonishing powers to make or unmake people's lives and reputations". He added: "Freedom of press is so precious that even the press should not be allowed to abuse it." Mr Varadarajan also agreed that "there is a public sense that media has become a law unto itself". He said the media should think of a way out to improve journalistic standards and avoid external regulation. Despite his views, Mr Katju agrees with editors that the government should stay away from regulating the media. But his point that a body like the PCI is best suited for the job has clearly not drawn support from the editors. Media bosses believe that the quality of journalism can be improved only with stringent self-regulation. Mr Mehta argues for the formation of an independent press complaints commission based on a similar body in the UK. Mr Varadarajan says that there are existing laws to stop misreporting, but they are not used efficiently by the state. 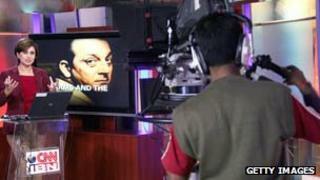 Mr Tharoor also says that the government should not indulge in regulation and a media body should do the job. "If we speak of better-regulated journalism, we are speaking of better journalism," he said.